As the world faces increasing social, economic and environmental challenges, there is an urgent need to connect and mobilize family business leaders in their capacity as a driving force and major contributor to the global economy. Family businesses are not only the backbone of most economies, but also manage to maintain resilience and market position without sacrificing their initial values or core customers and by developing close connections with the communities in which it operates, providing lessons to be learned for the broader business community. The World Economic Forum Family Business Community exists to connect the most prominent family business leaders worldwide and to promote shared understanding of the global issues affecting family businesses. It offers members a trusted space for dialogue and cooperation, helping them to understand the emerging trends and disruption from an owner’s perspective, to promote inclusive and sustainable growth in response to regional and global concerns and to prepare the next generation to lead in a constantly evolving context. The Family Business Community also involves a group of dynamic next-generation game-changers, who are committed to leading innovative activities that add value to their family businesses and to society. A network is about taking; a community is about trust and the willingness to give. 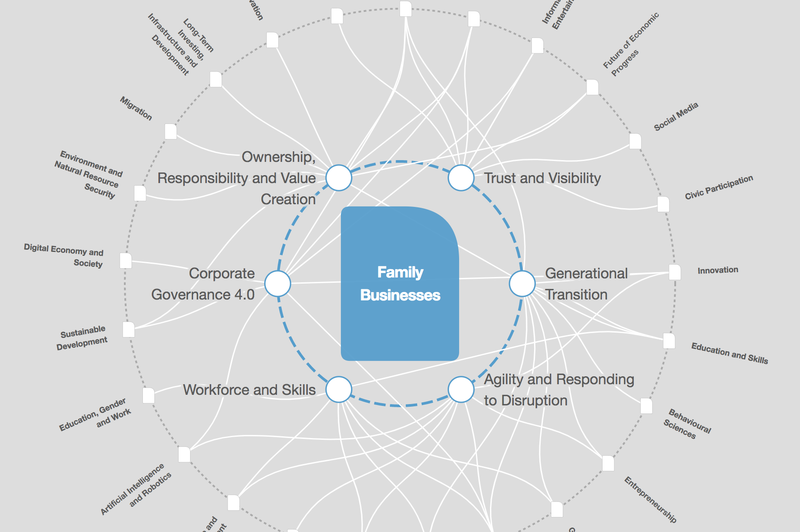 The Family Business Community is not about consuming knowledge but being part of a significant community of innovative, purpose-driven family business leaders and their next generation, who are committed to sustaining their business over generations, and to driving change using their business and family platforms. Free of any commercial solicitation or hidden agenda, our meetings are held under the Chatham House Rule, away from any media presence, allowing members to reflect on timely issues in a safe environment and to develop true relationships of trust. The rapidly changing nature of today’s economy, characterized by a new wave of disruptive growth, offers promise but requires strong, inclusive leadership to ensure that all of society’s stakeholders benefit from this new growth. The Forum recognizes that corporations and investors are powerful actors in society and can, through responsible leadership and long-term thinking, improve the state of the world. Controlling an estimated 70% of global GDP, family-owned and family-controlled businesses are a key stakeholder in supporting long-term value creation. In the coming years, $30 trillion in financial and non-financial assets are expected to be transferred from the baby boomers to the millennials. For the last three years, the World Economic Forum has collaborated with the Initiative for Responsible Investment (IRI) at Harvard Kennedy School, and now the Center for Sustainable Finance and Private Wealth (CSP) at the University of Zurich offering a programme for the next-generation wealth owners who are interested in learning more about practicing impact investment. The next generation of family business leaders are confronted with high expectations: in the world that is constantly evolving, an academic and executive education is no longer sufficient to be fit to lead: it needs to be complemented with an evolving perspective on emerging risks and opportunities affecting business and society. The objective of the World Economic Forum Next Generation programme is to prepare next generation game-changers to lead innovative activities that add value to their family businesses and to society and to think differently about priorities and risk management practices. It offers them a journey that enhances their skills, refine their world view and provide them with a sharpened understanding of a constantly evolving business environment. The programme includes stand-alone events, workshops at leading universities or think tanks, participation in the foremost global summits, learning journeys to discover new companies and experience major global issues, academic modules and opportunities to collaborate and test ideas with peers. For more information, contact Andrienne d’Arenberg, Head of Family Business Community, at FamilyBusinessCommunity@weforum.org. Small enterprises that see past short-term growth and adopt a sustainable approach have valuable lessons to offer the corporate world. Whether they are mom-and-pop stores or conglomerates, family businesses touch upon all aspects of life in nearly every country around the world. What role can they play?